Q: What are the two topics you should not bring up in public? Interestingly enough, the One Who so often is portrayed as a mild-mannered Messiah actually spoke quite openly and boldly about both of these topics. First let's see His sometimes abrasive approach toward religious topics. Luke 12:51 - Jesus warns that He did not come to bring peace but division. Matthew 12:34 - Jesus called the Pharisees a "brood of vipers." Luke 7:36-50 - Jesus confronts His host, Simon, in his own home and at his own table. Matthew 23:27 - Jesus calls the teachers of the law and Pharisees "hypocrites" and "whitewashed tombs." Mark 8:33 - Jesus calls Peter "Satan" because he did not "have in mind the things of God." Luke 11:37-42 - Jesus calls His audience a "perverse generation." Luke 6:6-11 - Jesus intentionally goaded the Pharisees by doing a miracle on the Sabbath. Mark 11:27-33 - Jesus refuses to answer a question when they refuse to answer His question. Matthew 10:14, Mark 6:10-11, Luke 10:1-12 - Jesus commands His disciples to shake off the dust from a city that will not receive His message. Luke 12:49-53 - Jesus says He came to bring fire down upon the earth and wished it was "already kindled." Matthew 12:39 - Jesus refuses to do a miracle and calls those listening a "wicked and adulterous generation." Matthew 21:23-32 - Jesus tells the chief priests and elders that "the tax collectors and the prostitutes" are entering the kingdom of God ahead of them. Luke 10:25-37 - Jesus intentionally uses a priest and Levite as the bad guys of His story and a hated Samaritan as a the good guy. Matthew 21:43-46 - Jesus tells the chief priests and Pharisees that the kingdom of God will crush them. John 8:31-44 - Jesus calls His listeners sons of the Devil. The One Who so often is portrayed as a mild-mannered Messiah, actually spoke quite openly and boldly about religious controversy. And lest we conclude that Jesus was only abrasive toward those who were abrasive toward Him, consider the following passages. Notice how He does not shy away from the truth even though it had the potential to drive away converts. John 4:7-26 - Immediately after the Samaritan woman indicates interest in Jesus' promise, the Lord brings up the messy situation of her five previous husbands as well as her live-in boyfriend. Matthew 8:18-22 - An interested student of Jesus wanted to become a full-fledged follower. "First let me go and bury my rather," he requested. Jesus responds rather bluntly, "Let the dead bury their own dead." Mark 10:17-22 - A very good man falls on his knees before Jesus and asks for spiritual advice. "Jesus looked at him and loved him." Then, Jesus brings up the one thing that He knew could potentially drive him away. "Go and sell everything… Then come follow me." The story concludes with this unfortunate line, "He went away sad, because he had great wealth." But perhaps the most revealing peek into Jesus' willful abrasiveness is the time He publicly confronted the religious leaders in Matthew 23. Notice just one example from this rather lengthy tirade of sharp religious condemnation. Jesus is mid-way through His famous list of "Woe to you..." statements when He stops to address the subject of evangelism. Few things were more important to Jesus than the subject of evangelism. Yet, when given the opportunity to embrace the evangelistic efforts of his fellow Jews, what does He do? He levels against them the harshest of indictments, "...you make him twice as much a child of hell as yourselves." 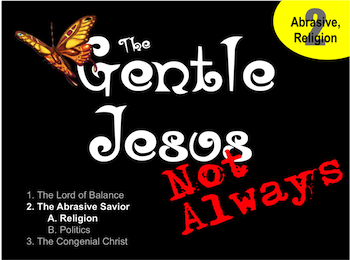 The "Gentle Jesus?" NOT ALWAYS! And especially NOT ALWAYS when it came to the most important part of the human experience, the appropriate response to God's sovereignty. What applications can we draw from this eye-opening list of unexpected abrasiveness? 1. Jesus attacked religious conflict head on and with great harshness when necessary. 2. Jesus never compromised the truth in order to win favor with His audience. 3. Jesus did not soften His presentation just because He was in public. 4. Jesus did not bow to the pressures of religious "power players." 5. Jesus created opportunities to prompt religious debate. 6. Jesus placed His calling ahead of His comfort. 7. Jesus called it like He saw it. The next section will show that not all of Christ's abrasiveness was directed at religious leaders. Jesus also had a lot to say about social issues, race relations, and even politics. Do your own study to see what you discover about His nature! Back to Top of "The Abrasive Savior"